Marriage takes commitment. You must dedicate yourself to making it work. It is hard work and giving and taking is required. Do you walk away because you can’t find that loving feeling? No. Love is a verb, not a noun. Love is something you do, whether you feel like it or not. By practicing love, and honoring your commitment, the feeling will return. Your marriage grows stronger with each battle you fight. But, not always. There are times when divorce makes the best sense. Perhaps one of you has been unfaithful. Some people can get past infidelity but some never will. When you are unfaithful, you destroy the foundation of trust your partner had for you. He or she can apologize a thousand times, but that does not restore the shattered trust in the marriage. If you cannot get past infidelity, you may consider contacting a family law attorney. However, not everyone who sees a divorce attorney gets a divorce. In fact, some people seek the advice of a divorce lawyer while they are in counseling. This gives them an accurate picture of what a divorce looks like in their situation. The attorney can explain your rights, division of property, finances, and child support. They look at every case individually. Your divorce attorney is a great asset. If you do go forward with the divorce, they will fight for you during one of the most difficult times in your life. A family law attorney sees thousands of divorce cases every year. They can offer sound advice because they have been through everything you are about to go through. The attorney may suggest staying together and participating in counseling, or they may suggest a separation. Saving a marriage is the top priority when it is possible. They will know the laws in your state, and they will be a great resource when you find yourself thinking of divorce. If you have decided to go through with the divorce, your attorney will assist you quickly to reduce the risk of collateral damage. If there are young children in the home, you may need an attorney who has experience in handling child custody and support issues. They will help you set up child support, custody, and visitation. 1. You would rather be alone than in your marriage. If being with your spouse is so difficult that it makes you miserable, it may be time to get a divorce. 2. You are only in it for the children. Children are very perceptive. They know when something is wrong. Staying in a marriage only for them teaches them to give up their happiness for someone else. 3. You are being abused. NO abuse is acceptable, and rarely will it stop. 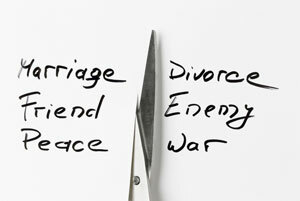 If you are experiencing mental, physical, or emotional abuse, it is time to get a divorce. 4. You have lost your trust and respect for your partner. 5. You are only staying because starting over on your own is too hard. 6. You are cheating on your spouse. If you are unfaithful, you are showing the ultimate disrespect. 7. You are only in it for the money. It is a leap of faith to step out on your own with only your income, but if you are only staying with your spouse for the money, it may be time to leave. Many people say it is time to divorce when your spouse says he/she no longer loves you. While that is sometimes true, sometimes it is just a cry for help. Counseling can be a helpful resource for couples to improve communication and possibly save their marriage. There is only one point of no return. That is when your spouse looks at you, and there is nothing in their eyes. No love, no pain, no anger; just nothing. If there are feelings, there is more work to be done. But a lack of feelings and intimacy is an indication the relationship is at risk. If the time has come to file for divorce, do not try to do it alone. Contact a divorce lawyer now. The longer you wait, the more damage is done. Putting it off only causes more pain and discomfort for the entire family. Competent representation comes first. The Law Offices of Paul J. Duron is focused exclusively on one field of law – family law – and we do not believe in the “generalist” approach. You need to be represented by someone who has mastered family law, who understands its nuances, and who can fight confidently on your behalf in the most complicated type of case.